So, how do I begin THIS one?? Well folks, we’re all about transparency here right? So I’m going to share a few do’s and don’t’s when it comes to online dating. Truthfully speaking, there are so many out there, but I’m going to focus on the ones that have resonated with me the most. So sit back, grab a drink, a snack (might I suggest Flaming Hot Cheetos?) and join me for a whirlwind of a ride! Be yourself. This is probably the most important one. No one wants to interact with someone who has issues with being themselves. How is anyone supposed to be intrigued by you and love you if you don’t know who you are? In my experience, I’ve learned that if people like you for you, then they’ll show you that. If they aren’t feeling it and they move on, I suggest you do the same – move on. There are so many folks out here that could potentially strike yo’ fancy…it’ll happen. Post pictures of that gorgeous smile. Let me tell you. As someone who despises their smile and their teeth, you certainly won’t see me covering it up. Luckily, I’ve learned about what angles work for me, but smiling is such a great thing to see in such an iffy world. I can tell you right now that I’ve come across profiles where guys had such beautiful smiles that I was instantly captivated. In that moment of ogling at those pearly whites, I realized that I wasn’t really caring much about what they looked like physically. I was immediately attracted to them because of them smiling away at me and everyone else that came across their profile. Write a book when sending a message to someone. Ok, so I get that people want to show that they’re fully transparent when it comes to dating – great, awesome, fantastic. But please, folks, PLEASE, do not write novels when communicating with someone for the first time. I’ve had dudes tell me their life story or profess their love to me before meeting. While I appreciate their candor and passion, it’s also overwhelming. I see messages like that and think, “Is this dude gonna smother me like smothered pork chops?” or “Is he possessive?”…the list goes on. In other words, just don’t do it. You can be creative with your opening, but don’t write something that’s going to take 10 years to read, mkay? 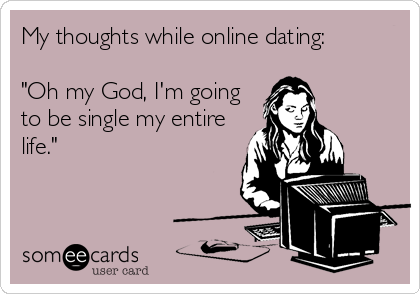 Don’t put too much pressure on yourself to find THE ONE when venturing into the world of online dating. It can be extremely frustrating and discouraging if you think that every dude or dud-ette you go on a date with is your future person. While I think it’s important to express the things that you are looking for, I think it’s also important to go into it with an open mind. Don’t put all your eggs in each person, only to end up heartbroken and discouraged. Be open to the fact that you might meet someone who is/isn’t fantastic and ends up/doesn’t end up being a great, future SO. Try to stay positive even if it doesn’t work out. Know that there are peeps out there just like you, trying to survive in this world and find an awesome person to share it with. I’ve heard horror stories of folks dating someone that had a whole other family out there. Our society is constantly connected which makes it very difficult to find genuineness within each other. We constantly lie to each other via social media in order to portray a certain lifestyle, brand, sense-of-self. Don’t do that. It’s bad enough that people have this warped, skeptical view of online dating, let alone run into folks that lie to them to their face. This kind of goes back to the first “Do” in being yourself. The two go hand-in-hand as realness and truth are what will get you far, not just in the online dating world, but in life. I think I’ll stop here as I could go on and on, and this little bit has already gone on long enough. I love talking about my experiences with online dating because I’m not ashamed to say that I’ve done it. I’ve met my fair share of weirdos, but not as many as you’d think. Most of the crazy (for me) has happened, thankfully, before I invested in the time to make myself look cute and leave the house and meet up with folks.